Mercury’s quicksilver ability lies in collecting, considering and distributing information and ideas in order to stimulate thought and new perspectives. In mythology this was Hermes, the Messenger of the Gods, whose function was to communicate between the gods, and also between gods and people. This is a metaphor for the dual purpose of employing the mind for both mundane interaction and to access higher realms of inspired wisdom. There is the ability for a type of negotiation between unconscious and conscious processes that brings an easy understanding of instinctual images such as dreams and symbols, also a ready appetite to learn new things and an ambitious thirst to satisfy curiosity with information and explanation. Mercury is clearly the operation of Mind. It is that which shapes sensory data into patterns of understanding so that intelligence can exist. It creates models to pull together ideas and things into combinations that allow insight, understanding, knowledge and regularity – also, due to exceptional quickness of the nervous system, manual dexterity. It is finely attuned to patterns of similarity and differences so is excellent at observation, methodical analysis and critical examination. Its mental flexibility is inclined towards logical tactics, finding new paths and new ways to see things, and has an orientation to avoid difficulties by skirting around issues. With no agenda or preference it carries messages between giver and receiver, so is the natural networker and communicator, whose highest achievement is language – the system whereby sounds and marks can carry messages from one to another and indeed between the two halves of one’s own brain. Linguists teach that language does more than explain our ideas – it shapes them – and none appreciate the power and nobility of language more than smooth talker Mercury, exemplified by fine speech and quick witted rhetoric and humour. Also, our narrative style is more than just how we present the story of our thoughts to others, it is also how we think them, how we sort them and pattern them into understandings, criteria and preferences. Mars implements our decisions yet Mercury is responsible for recognising the life choices available to us and sorting out the criteria for the decision-making. Combining facts and feelings, it quickly ascertains ideas and mental processes, having an ingenious capacity for following the train of an argument and differentiating between the reasonable and the absurd. It is the planet that weighs ideas and examines the accuracy, authenticity and usefulness of them, having a good grasp of relevancy and meaning. A doubting manner is fostered since it leads to a deepening of judgement and then the adaptation of what doesn’t quite add up into something workable. 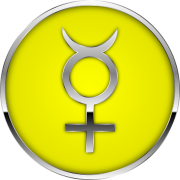 When Mercury is strongly featured in a horoscope, invariably the person has the type of occupation that requires good communication skills or clear, analytical thinking. Mercury types include teachers, school children, students, analysts, critics, scientists, researchers, journalists, translators, linguists, accountants, traders, poets and songwriters. Yet it also includes those who use words to deceive: liars, tricksters, attorneys, forgers, thieves, salesmen and politicians. It can be audacious, crafty, wily and sly, feeling no obligation to honour values, a cunning bluffer who is false and corruptible, ice cold, calculating in business (‘would sell his own grandmother’), profanes the holy and, unable to see the whole picture, holds but a superficial interest in everything. The bard Bob Dylan is an example of those with strength in Gemini, which Mercury rules, but so are the sinister liars Trump and Blair. According to the element of water, earth, fire and air, its position shows whether we formulate our thinking with a bias based on what we feel, what works in practice, what to do next or how best to present thoughts to others. In signs, this goes further into whether we tend to be original, adaptive or deepening, and in houses shows where in our life circumstances this attitude is most clearly observed. In Aries my thoughts indicate what I need to do next, in Cancer my words take into account how you would feel if I said that, in Aquarius I contemplate what benefit humanity gains from my new ideas, whereas in Virgo it matters to me whether useful information is being passed with a minimum risk of inaccuracy or controversy.